Everyone has their own opinion, but this restaurant is on everyone’s top 5 list and is my #1 pick. 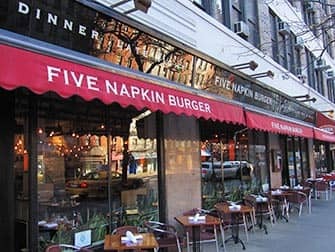 Five Napkin Burger is a burger restaurant where you can also order sushi and other dishes, which is perfect when you are dining with someone who wants to eat healthy while the other wants the best burger in New York. 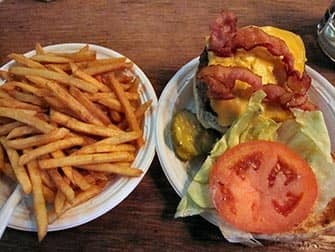 The best burger at this restaurant is called the Original Five Napkin Burger. 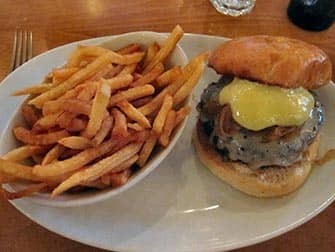 On this burger, there is special cheese and sauce. It is a big, heavy-duty burger, which not everyone can finish. The French fries are hit-or-miss, but usually good. Location: Multiple, but the real spot is in midtown west of Manhattan, not far from Times Square. Eric’s Tip: Between 18:15 and 21:00, there is usually a waiting time of one hour or more. Additionally, if you go between noon and 13:00, you’ll probably have to wait, so take this into account. At this restaurant, you will find delicious food in a nice atmosphere, but it is always crowded. This burger restaurant is really a bar. Do not expect fancy cutlery, plates, and glasses. Don’t be surprised if there is a long queue. The best burger here is the Bistro Burger. 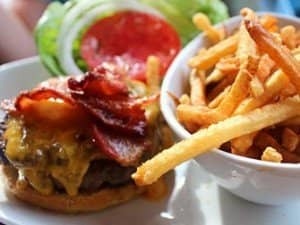 This is a burger with cheddar cheese and bacon. The burger is not too heavy, but big enough. The French fries here are always very deep fried. Eric’s Tip: This is definitely something that you must try at least once. It’s a fun place for lunch but not really for dinner. The wait for lunch can sometimes take up to 30 minutes. This is also a nice spot to drink a beer at the bar. This bar accepts only cash and no credit cards. In the super deluxe Le Parker Meridien hotel, there is a hidden gem. Walk through the lobby and just left of the reception, you will see a narrow corridor. You will be surprised by what you see! You will end up in a burger hang-out for “students”. Burger Joint has an underground atmosphere and it will look as if you’re in a cave, but the burgers are oh-so-good. The best burger is the cheeseburger with “All the Works” (which means everything on it). This is truly an experience and definitely a fun surprise to find. Burger Joint is good for lunch or a snack, but not a romantic night out. Eric’s Tip: Don’t ask too much here. If you do not know what you want to order, then wait before getting in line. Don’t ask them if they have anything. Their motto is, “If you don’t see it [on the menu], then we don’t have it.” There are always long waits throughout the day to eat here. I have had the most success between 15:00 and 17:00. 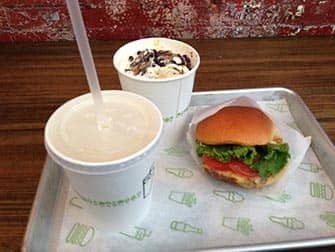 Shake Shack is known for their amazing milkshakes, and their amazingly long queues. They have many locations throughout New York. My advice? Avoid the one on 8th Avenue, it’s always very busy. Head to any of the locations outside of Midtown. However, if you want the ultimate experience then go to their first location at Madison Square Park. Expect to wait. If you just want to have a milkshake then make use of their C-Line to skip the regular line. And if they ask ‘Do you want it malted?’ Say YES! Isn’t this a burger top 5? Indeed, their burgers aren’t bad either. Get the Shack Burger. Eric’s Tip: Although you think it’s crazy for people to wait so long for a shake or burger, it’s worth it! A wait of only 15 to 30 minutes is a really good time to go. In the summertime, it is always busy, but not really before noon. When the weather is colder, it is not as busy in the evening. A small shake is more than enough because the shakes are quite rich. Personally, I always share my shake. 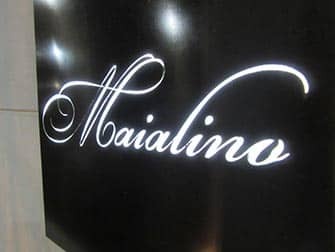 Maialino in Gramercy Park Hotel is a wildcard. It’s not a burger restaurant, in fact the only burger they serve is only available for lunch! The burger is tasty with gorgonzola, bacon and red onion. The atmosphere in Maialino is unpretentious and cosy but busy. There is also a club in the Gramercy Park Hotel, and it’s hot. Ladies in high heels, arriving in limos, you get the picture. If you don’t get in, don’t worry. Neither did I. EXTRA! Category: Sliders. The STK Slider. Sliders are mini burgers. You often find these on the menu at sports bars and other places that serve finger food. 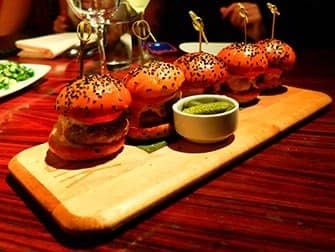 The restaurant called STK in New York has absolutely the best sliders in all the country. 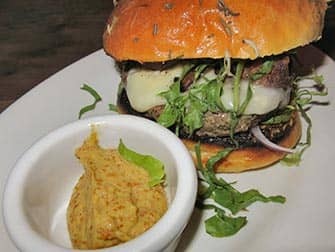 This upscale, fancy, hip restaurant where the celebrities dine, has sliders called “Little Big Macs” on the appetiser menu. They are out-of-this-world delicious. 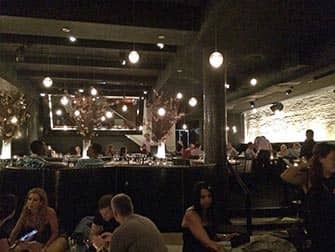 STK is an expensive steak house in the Meatpacking District. The Little Big Macs cost $20 for two sliders, but there is enough for you to share them. 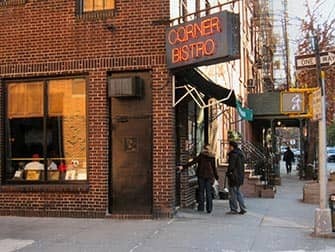 The rest of the menu is certainly not cheap, but the chance that a famous rapper or model is sitting next to you is also possible. Price of the slider: $10 each, but are sold per two. Eric’s Tip: Reservations are a must here and every day of the week the restaurant is packed. As mentioned above, this is an upscale restaurant, so wear your neat clothes. Sometimes there is a DJ spinning. In the restroom, there will be an attendant to hand you the soap and towels. When first arriving to STK, you will not be greeted warmly until you have stated that you have a reservation. After that, the staff will be very friendly and accommodating. You can also order the sliders to eat at the bar in the restaurant. Definitely a treat to surprise your dining companion. Expect a bill of $100 to $150 per person depending on the drinks ordered.